In the News (from The Guardian): “Atheist camp to give children ‘godless alternative’” An atheist summer camp for children is to be held in the UK for the first time this year, offering a “godless alternative” to similar religious events under canvas… The purpose of Camp Quest UK, which has been praised by the atheist and skeptic author Richard Dawkins, is to encourage critical thinking and provide children with a summer camp “free of religious dogma”…Camp Quest UK’s website says its counselors and volunteers will lead activities teaching eight to 17-year-olds “about science, free thought and humanist principles. Activities cover critical thinking, science, history, human rights and ethics”. My Comment: The religious view of God as an angry or an all-forgiving persona originated from ancient human fears of Nature and our desire to safeguard and secure ourselves. But the complete negation of a higher world (which is impossible to perceive using our egoistic desires but which we are in a position to perceive if we change our desires in the opposite direction) also restricts a person to the physical world without giving him an understanding of “science, free thought and humanist principles.” In fact, the denial of religion gives birth to yet another religion. Kabbalah explains that this world consists of two forces. Our world is based on the force of the will to receive. But an opposite world is possible, an anti-world, which is based on the will to bestow. Kabbalah is the method for the revelation of this other world to man. In the News (from The Times Online): “Alcohol-related deaths up by 40% in ten years” – The number of people dying from alcohol-related causes rose by nearly 40 per cent from 5,287 in 1999 to 7,341 last year, figures obtained by the Conservative MP James Brokenshire, a shadow Home Office minister, show. My Comment: Only education is able to change society and bring it to the perfect state, so that it will positively influence the economy, culture and the path of progress. I have included methods of the re-education of society according to the principals and methods of Kabbalah in my book “The Last Generation.” (available in Hebrew). There is no other path of salvation for all nations and the world. Kabbalah does not just offer obvious natural methods such as education, but a method of self-discovery and change that is based on the structure of the Nature of the worlds and the souls. Therefore, though the actual proposal sounds trivial, it means “The Kabbalistic Education – A Person Changing Under Influence Of The Upper Light,” which takes place exactly with “usage” of Kabbalistic texts. It is not just the studying of these texts as informational material that causes the change, but also the studying with the intention of changing one’s own qualities. In this case, a person draws onto himself the Upper Quality – the Light. By using this method, we can change ourselves and the world for the better. All other actions lead to the growth of evil in order to come to recognize it and then subsequently to return to the method offered by Kabbalah. The world is something that we perceive and it does not exist outside of us. It depends only on our individual inner qualities. Therefore, when I say “education” I mean the complete change of a person from the level (of comprehension) of this world to the level (of comprehension) of the spiritual (eternal, perfect) world. The manner in which a person perceives the world is the same manner in which he perceives himself. (See material about the perception of reality). In the News (fromThe Huffington Post): “Schwarzenegger Declares Fiscal Emergency In California” Gov. Arnold Schwarzenegger has declared a fiscal emergency to address California’s deficit and has ordered state offices closed three days a month to save cash. The government shutdown will lead to a third furlough day each month for 235,000 state employees, bringing their total pay cut to about 14 percent. My Comment: This in relatively well-to-do California! So what about Mexico just across the border? On July 14, I held a public lecture at the Bnei Baruch Kabbalah Education Center, discussing Baal HaSulam’s article, “The Essence of the Wisdom of Kabbalah“. 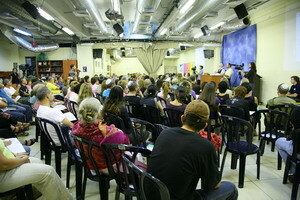 The Bnei Baruch Kabbalah Education Center hosts public lectures every Tuesday at 7:00 PM Israel time. The lectures are broadcast live on our TV channel “YES-66” and the Kabbalah TV website and are translated live from Hebrew into English, Spanish, French, Italian and Russian.